My Maverick stock saddle is different entirely from the conventional Australian stock saddle. Although the Maverick saddle tree is made from the same high quality materials as the normal saddle tree, the way it sits on the horse is different, as is the feel and balance for the rider. 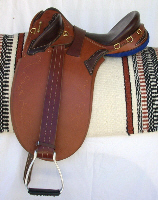 The Maverick saddle is an extremely close fitting saddle, as in sitting low over the horses back. I confidently claim there is no saddle available that allows the rider closer contact to the horse. The Maverick saddle is a fender style stock saddle with the fenders hanging off a spring bar slung under the tree thereby eliminating unwanted bulges caused by stirrup leathers (fenders) hanging off the bar sitting on top of the tree. These saddles are lined with sheepskin, requiring very little maintenance. Once again, they are meant primarily for heavy duty stock work, but equally, are a beautiful saddle for pleasure riding, endurance etc. As with all my stock saddles, they are designed to fit a horse like the Australian stock horse, and are not suitable for ponies or some heavier breeds. My felt lined stock saddles are built on saddle trees more on the lines of the Australian stock saddle tree, and although at a quick glance they might look like the Maverick saddle, they are not. These stock saddles are a very good Australian stock saddles just the same. With the leather market changing worldwide, no guarantee is made on where my leather is purchased, but only the best qulaity leather available is used, and always will be. Handmade saddles offer the rider the flexibility of having changes made to suit individual requirements, and enables the manufacturer the opportunity to make changes or improvements to his/her product at any time the need arises. Handmade saddle trees have these same advantages. The saddle trees I make are a mixture of old-style and very modern products: wood in a laminated form used for the side bars of the tree has proven to be a very successful product for that purpose for the 23 years I have used it; polyurethane for the gullet, and in some trees the cantle as well; in all cases the tree is lined with steel which makes the gullet almost unbreakable. My Campdraft saddle, the Campdrafter, is in the first instance a sound, solid Australian stock saddle. Made on conventional Australian stock saddle lines, it is made and designed for the heavy workloads that the Australian stockman endures. It is of course built on my laminated wood saddle tree, and is finished not to flash and fancy show standards, but well above the standard of poorer quality Australian stock saddle copies that use "shiney bits" to attract attention. These Campdrafter saddles will last many years of regular hard work, and if looked after, will still present well at any show or Campdraft event. There is a choice of mounts available on the Campdrafter saddle, but generally they will be supplied with normal Australian stock saddle mounts. 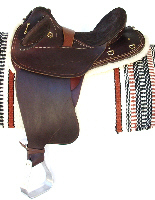 My standard Australian stock saddle is made on similar lines to the Campdrafter but not as much handwork, so they are offered slightly cheaper than the Campdrafter.